I wanted to pair both the stakes and the cord with my new Six Moon Designs Lunar Duo tent. The Lunar Duo requires 6 stakes at a minimum and 12 when fully guyed out, however, I am not concerned with 2 of the guyouts on the tent, so I only needed 10. Also, the Lunar Duo comes with 4 guyouts about half way up which did not come with guylines, so this is why I wanted the guywire. So, Lawson sent me 10 of the 7″ Ti-Eye stakes and 50′ of the Dyneema guywire. Last weekend I headed to the Smoky Mountains for 2 nights and I specifically chose campsites for both nights so that I could pitch the tent rather than stay in shelters. Before I left I cut some of the Dyneema cord into 4 sections, each about 5 1/2 foot long, and installed them as guylines on the upper guyouts on the tent. The great thing about this cord is that since it is 2.25 mm in diameter it will work with the Line Loc 3’s, which is what I wanted. I love how simple these line locks are to use so I wanted a cord to match it, and this cord works beautifully with them! Disclaimer: I received these complementary Ti-Eye Stakes & Dyneema Guywire from Mountainfitter in exchange for a review. 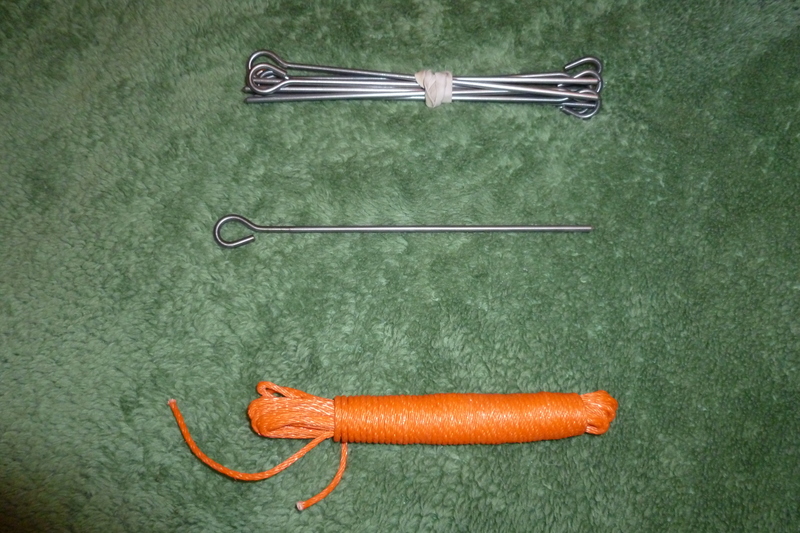 This entry was posted in Cord/Rope, Gear, Gear Stores, Tent Stakes and tagged Dyneema Guywire, Groundhog stakes, Lawson Kline, light-weight stakes, Line Loc 3, Lunar Duo, Mountainfitter.com, Six Moon Designs, Smoky Mountains, Ti-Eye Stakes, Titanium Stakes. Bookmark the permalink. Stick, how much do each of the Ti-Eye stakes weigh? I can’t tell from the photos, but do they have a point on the end or are they blunt? Sorry, I didn’t include much of the specs in the text but it is in the videos. The 7″ stakes that I have here are 7 grams each, or 0.2 oz each, the 6″ stakes are 6 grams and the 8″ are 8 grams. And yes the ends are pointed, which is why I have them turned into each other in the rubber band. Lawson suggested to turn half the stakes pointing one way and the other half the other way and then bind them with a rubber band so that the points are less likely to cause damage to anything else.